‘Tis the season to be crafty! I definitely take pleasure in creating things and love the aesthetic of homemade goods, but I also have very little skill and therefore like to keep things at a 3rd grade level. So even if you’re a novice you can do this craft. Really. It all started about 2 weeks ago while on my quest to start my holiday shopping early this year. 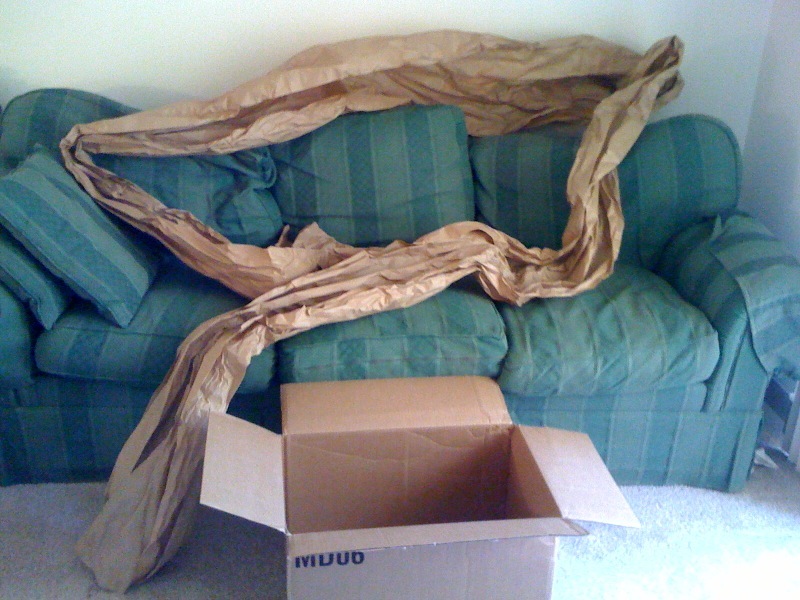 A large cardboard box arrived on my doorstep, thanks to a major online retailer, but I found it to be quite poorly packed; the item took up less than half the volume of the box and the rest of the space was occupied by an enormous sheet of brown paper, I’m talking nearly 3 feet wide and 9 feet long! I don’t even understand what purpose the paper was serving; it was not a fragile item (a snowboard bag) and a large sheet of paper would not have protected much of anything from shipping harms. The company didn’t even take the opportunity to brand it – it was completely blank! Simply tossing such a lovely, large piece of blank paper in the recycling bin seemed an abomination – people pay for paper like this! It was an excellent opportunity in craftiness to be seized, so I got to thinking about the variety of applications it could befit. I already had plans to buy cardstock and rubber stamps to make custom holiday cards so I just extended that stamping to the paper. 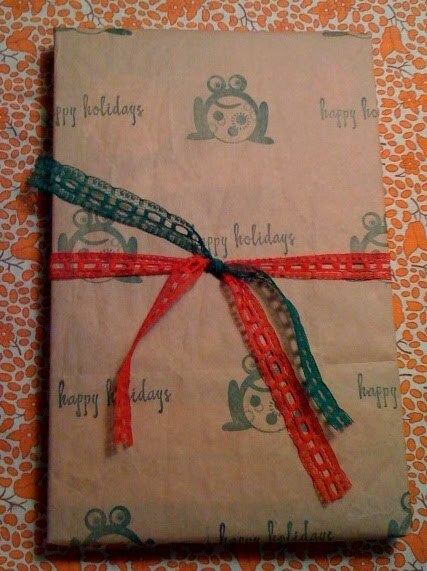 Lo and behold, custom wrapping paper! 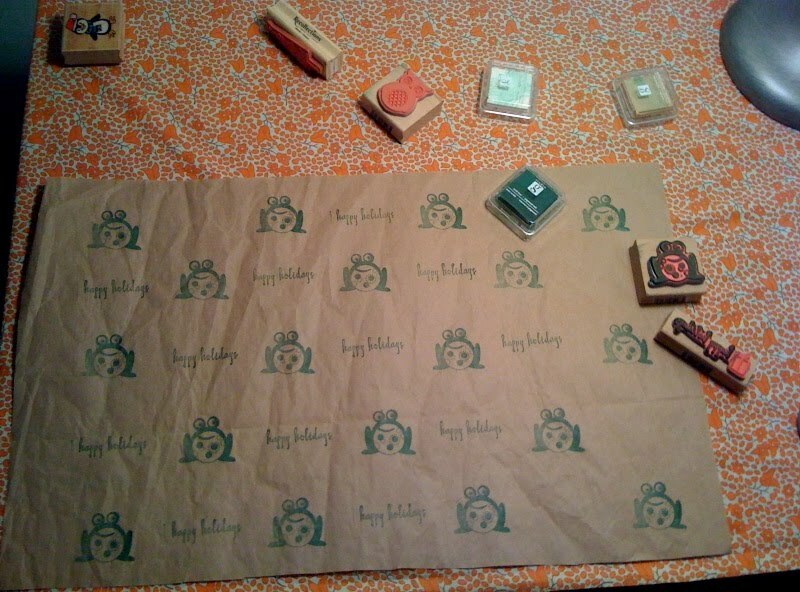 I pre-cut the sheets to the size of the presents and used standard rubberstamps and craft ink pads for these first few sheets. I think in the future I will use a craft paint for a deeper color and longer stamping life. 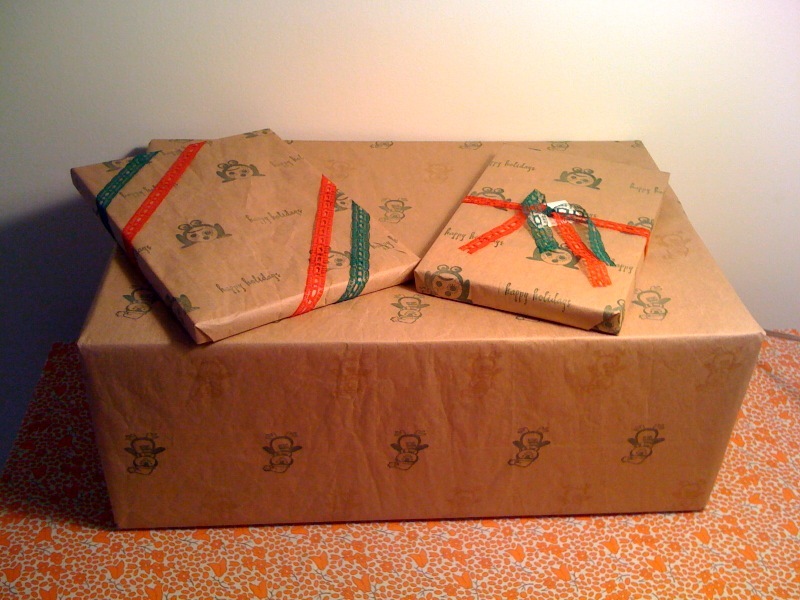 You’ll notice that the wrapping on the books is a bit more wrinkly than the large box and that’s because I briefly ironed the larger piece. (Warning: be extremely careful when ironing paper! Only do it on a low setting and keep it constantly moving!) I like that the book paper is wrinkly because it brings back memories of my schoolbooks that I [my Mom] used to cover in paper grocery bags. I also really like that each sheet is custom. The recipient of the larger box happened upon my craft table and requested “Penguins only!” and so I was able to fulfill his request…and make a matching card! Now you too know what to do when the universe (or an online retailer) brings blank, craftable materials to your doorstep. Carpe diem! How fun!! I love this :). I'm heading out today in search of some fun stamps. I bet we could make those, too. Now you have me thinking!